Here is another recipe inspired by our Founding Fathers. Asparagus became widely available in America during Colonial times, and was a particular favorite of Thomas Jefferson. 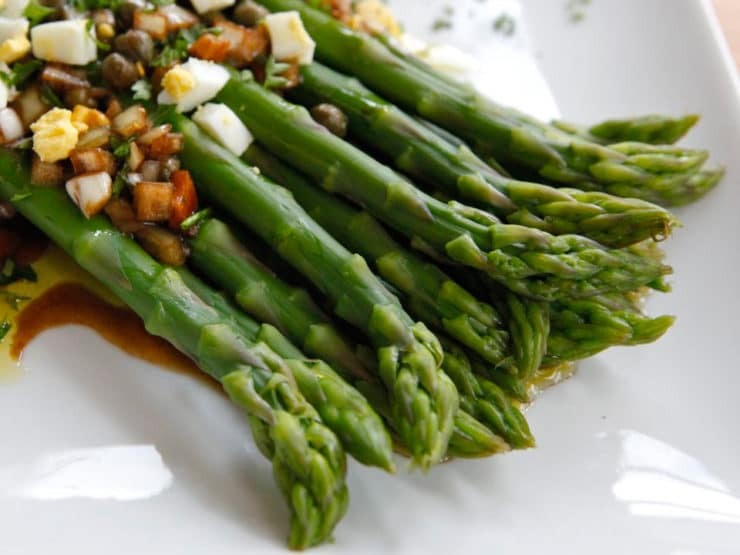 This is a common French preparation of asparagus that dates back a few centuries. Jefferson enjoyed this recipe for asparagus while he was Minister to France. Given how much asparagus grew in his gardens at Monticello, he surely would have instructed his enslaved French-trained chef, James Hemings, to prepare it this way for his American guests. This recipe appears in The City Tavern Cookbook, a collection of historical recipes compiled by Walter Staib. Staib is executive chef at The City Tavern Restaurant in Philadelphia. The City Tavern opened in 1773, and played host to the Founding Fathers of our country during the late 18th century. The original City Tavern structure was destroyed in a fire and demolished in 1854. In 1948, Congress commissioned the historically accurate reconstruction of the building on the original construction site. The Tavern reopened in 1976, and in 1994 Restauranteur Walter Staib took over as chef. Food continues to be prepared at the Tavern in the traditional colonial style. The City Tavern, Philadelphia, PA. Photo courtesy of Concepts by Staib. 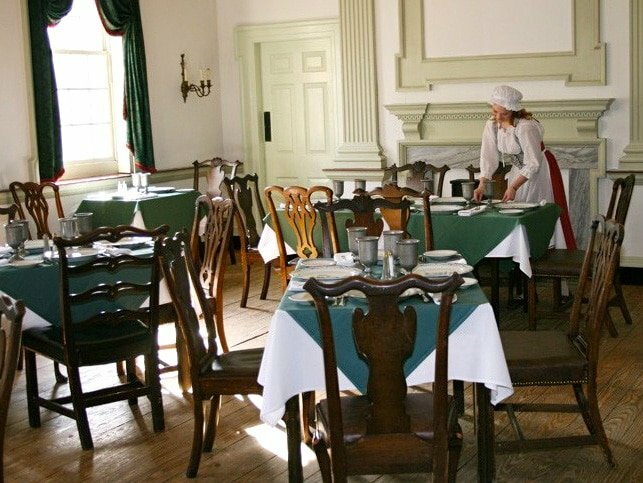 City Tavern was the unofficial meeting place of the First Continental Congress. The dishes in this cookbook were enjoyed by the likes of Thomas Jefferson, George Washington, Benjamin Franklin, John Adams, and even Benedict Arnold. Many of the recipes are French in origin. At that time, the upper classes aspired to emulate the French in many ways. Colonial Americans favored French food, serving styles and social graces. Given Jefferson’s preference for vegetable-based cuisine, and his particular love of French food (as outlined in my previous Jefferson post), this dish would likely have been high on his list of favorites. Jefferson had a square in his Monticello garden reserved for asparagus; it was one of the few vegetables for which Jefferson documented a cultivation technique (the plants were mulched with tobacco leaves). Jefferson recorded its seasonal arrival at his Monticello table 22 times, usually in early April. City Tavern prepared many French-style dishes to please its patrons, which makes this an appropriate seasonal choice for the Tavern menu as well. 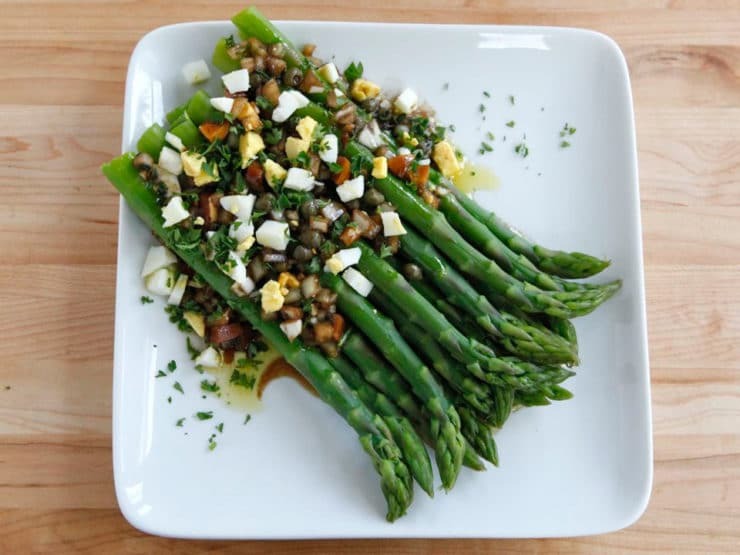 This light asparagus preparation is flavorful and dairy-free. I have adapted it just slightly by recommending a few minutes for marination (to allow the flavors to soak in) and an extra garnish before serving. I’ve also recommended using olive oil for the dressing, rather than the vegetable oil called for in the original recipe. According to paperwork found in his archives, Jefferson had olive oil shipped to him from Bordeaux after his time in France, so it would not be out of place to use it in this recipe– it suits this dish well. The vinaigrette dressing is mild and infused with fresh thyme; the flavor improves with time. It can be prepared a day ahead if desired– if you do this, the egg pieces will “pickle” in the vinegar and turn a pretty purple color. An additional garnish of hard-cooked egg and fresh chopped parsley gives it a special touch. This is a very unique vegetarian side dish, and a lovely taste of history… perfect for celebrating President’s Day. I presented this soup and three other historical Presidential recipes on ABC’s 7Live in San Francisco. Check out the video clip – click here! Wash the asparagus and trim the tough ends of the stalks. In a large saucepan, bring 2 quarts of lightly salted water to a boil over high heat. 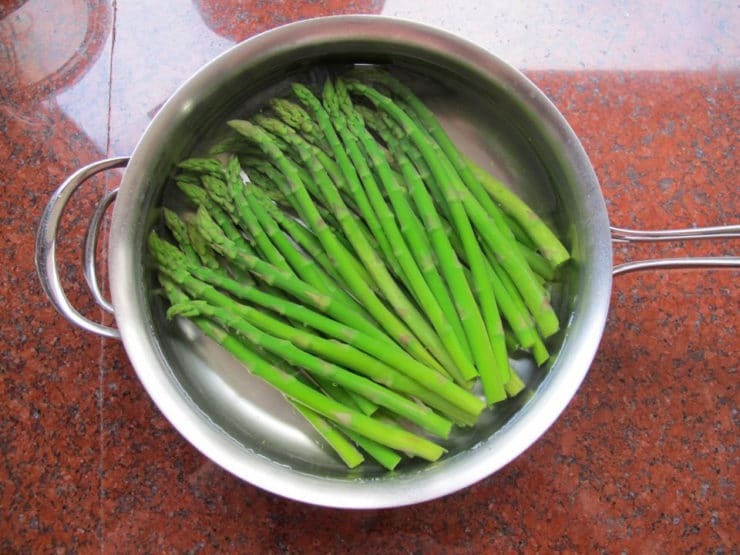 Place the asparagus in the water and cook until just tender, 2-3 minutes. Drain asparagus. 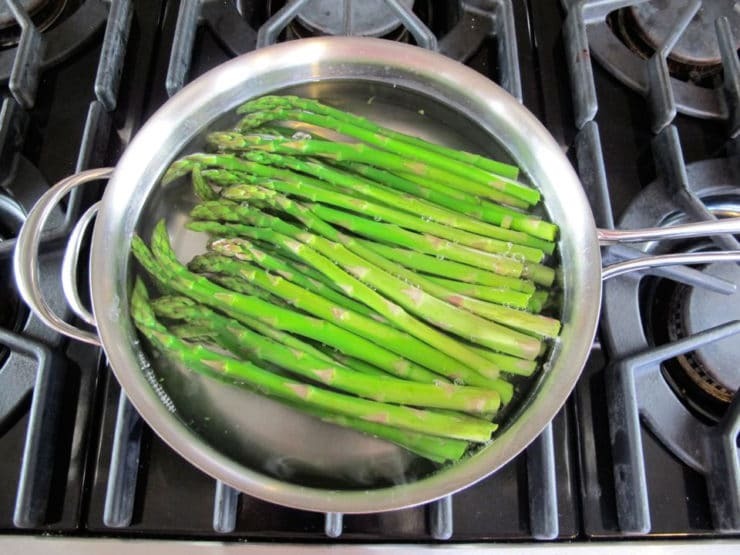 Add enough cold water to cover the asparagus. Let stand about 5 minutes, until the asparagus is cool. Drain again and pat the asparagus dry with paper towels. In a medium-size mixing bowl, whisk together the vinegar, oil, thyme, parsley, egg, onion, and capers, and salt and pepper to taste. Place the asparagus on a serving platter. Pour the vinaigrette evenly over the asparagus. 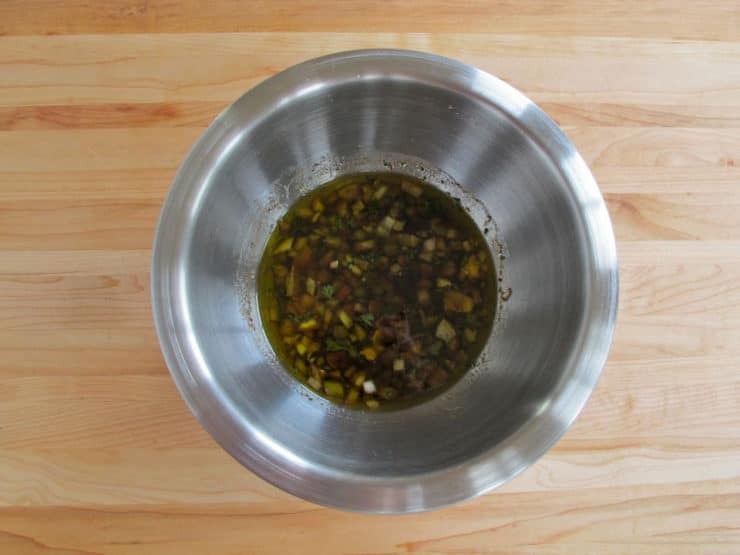 Let the asparagus marinate in the dressing for a few minutes (optional). Garnish with additional chopped egg and parsley, if desired. Serve at room temperature. Note: This recipe is kosher for Passover. If preparing for Passover and strictly kosher, make sure your red wine vinegar, oil, and capers have a Passover hechsher. If making gluten free, use GF-certified products. Staib, Walter (2009). The City Tavern Cookbook: Recipes from the Birthplace of American Cuisine. Running Press Book Publishers, Philadelphia, PA.
DeWitt, Dave (2010). The Founding Foodies: How Washington, Jefferson, and Franklin Revolutionized American Cuisine. Sourcebooks, Inc., Naperville, Illinois. Fowler, Damon Lee (editor) (2005). Dining at Monticello. Thomas Jefferson Foundation, Inc. University of North Carolina Press, Chapel Hill, North Carolina. Wulf, Andrea (2011). Founding Gardners: The Revolutionary Generation, Nature, and the Shaping of the American Nation. Knopf, New York, NY. Thank you for sharing this recipe. Its nice to have a creative way to serve asparagus. I cooked this and wow, it was very delicious. Thanks for sharing. Yey, that’s a great video :-). You are so natural in front of the camera! And a great recipe! I just bought asparagus and was thinking what to make with it tomorrow – perfect timing :-). And I love the City Tavern – such a cute restaurant. I am definitely going there again next time I’m in Philadelphia. Have a great weekend! Oh, this is just delish! Honey Bunny LOVES asparagus and he’d adore this recipe! Fascinating history – as always…I had no idea that his garden was so well documented! Thanks and have a GREAT weekend! A history lesson and a delicious dish – I love it!